Last year I finally took the plunge into being a full-time freelancer. Unfortunately, I didn’t have any of the equipment that I would need to work from home for 8 hours like, a standing desk, or chair. I guess all businesses have a start-up cost. Luckily for us (if you already have a place to live) then those costs are relatively cheap. I’m a freelance translator, and I’ve always felt more comfortable working on a laptop. I like to move around, type on the sofa, edit in bed, take my work to the patio on sunny days or maybe even a cafe if I feel like emerging from my cave. One thing I underestimated though is how bad it is for your neck if you work full time on a laptop. I realized something needed to change, or I’d have a crick in my neck for the rest of my life. 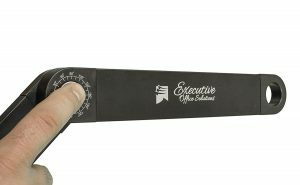 I started digging an found the Executive Office Solutions Laptop Stand. I’ve been using it for about year now and wanted to run you guys through the features, pros, cons and anything else I think you should know. So, let’s do it. This thing is actually pretty simple. There’s not a whole lot to it. As you can see from the photo, it’s a flat top where you put your laptop, and it has a leg on each side with three hinges on each side. These hinges move in 360-degree circles so you can basically make any shape you want. It’s made out of lightweight aluminum, so mobility isn’t an issue either. I usually just leave it on my desk in a C-shape (see photo), because, for me, that’s a perfect height for when I both sit and stand at my desk. I’ve actually found that I don’t have to change it around that much either. I can grab it, in that same shape, and move to my bed. I’m 6’3″ and a pretty big guy, but I can fit snuggly under it. The woman in the photo below is using it more open than I have it. I don’t really see the need for that, but you can do it however you’d like. (I also wouldn’t recommend working on the ground but, oh well). Obviously, if you’re going to use this on your desk, you can’t put your laptop on it and then type. Your shoulders would be burning after 20 seconds. You’ll most likely have to get a Bluetooth keyboard and mouse to go with it. However, for sitting on the couch or in bed, it’s perfect. It’s not flashy, or all that exciting, but for me, someone who likes to work on a laptop and to have the freedom to take it anywhere I want, it’s been one of the best things I’ve ever bought for under $40. Laptop stands for the win! 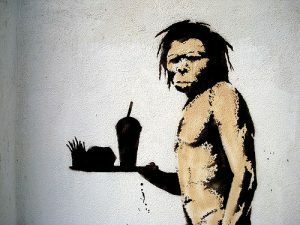 Should I get a desktop computer now that I’m a full-time freelancer? Ya, probably. Maybe I’ll put that in my 2018 budget. For now, I love the executive office solutions laptop stand because I can move my work wherever I go and let’s be honest, that’s the main reason I became a freelancer in the first place. Freedom. Editing in bed, working in the sun on the patio, or sitting at Starbucks and pretending to work while everyone’s writing their screenplays is a lot easier now with this stand. I’d definitely recommend it if you’ve got a permanently-bent neck from working long hours on your laptop. Even though this laptop stand gives you the freedom to move around you should definitely be doing the build of your work from your office. Setting it up and find that perfect spot can be tricky, so I broke down some things you should look for in my article: How to Organize a Home Office – Function and Comfort over Form. Endnote: There’s even a model that comes with a fan and a mouse pad for about 5$ more (click here). Might be worth looking into. This stand is totally awesome. In terms of using it as an actual table is not really possible, but in terms for using a laptop all day (which would be someone like me), this is perfect. I think the thing that stands out about this laptop stand is that it calibrates according to the user, not the other way around. We usually try our best to adjust our seating or posture to be compatible with the table we use. This laptop stand gives us the freedom of sitting wherever we wish whether it is on the floor, on a short stool or a high swivel chair. I just hate the idea of slouching myself just to adjust to the surface I am typing on. It simply makes my neck hurts. This stand solves that beautifully. Even though this stand is cool and all, my question is, does it topple over easily? Or is extremely stable? Thanks for leaving a comment. If you’re a freelancer who prefers to use your laptop (like me and you) then this stand really is perfect. I’m actually sitting in bed using it and responding to you right now. It really helps take the strain off of your neck. I’ve never had any problems with the stability but you have to make sure that the last section of the legs are completely flat. Other than that, no problems. Thank you again for leaving a comment. Happy Freelancing! I have been looking for something like this for quite some time now. 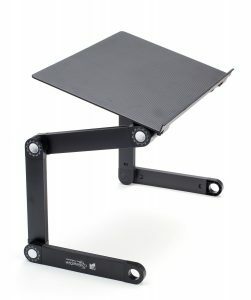 After reading great articles about how good it is to stand when you work on the computer, I was considering buying a very high table to put my laptop on so I could stand and type. Evidently, it is very bad for you to be sitting for long periods of time and the evidence for this is profound. Now this little table will fit on top of my chest of drawers which will double as a lower desk with the computer adjusted for me to stand whilst working. Great stuff. Perhaps you should add to your blog about the benefits of standing when using your laptop computer! I appreciate you taking the time to leave a comment. This little desk would be perfect for you. You can head to the Amazon page directly by clicking the links in the article. Also, I have actually written about standing desks. I have an article about stand-up desk workstations: What about a stand up desk workstation and also a few viable options for you to be able to purchase one: The Perfect Height-Adjustable Standing Desk. They both have information about the benefits and the proper use of standing desks. If you have any questions I would be more than happy to answer them. Please feel free to contact me. Thank you for informing about this great accessories for people like us who are based on freelance works. Without proper laptop or desktop table and chair without adjustment facility, it is very hard to work and also it creates back pain problem. 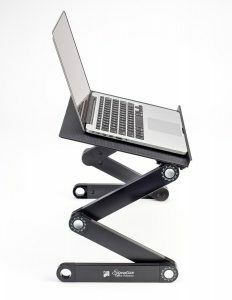 So, I m thinking to purchase this laptop stand. I appreciate you stopping by and leaving a comment. You’re exactly right about proper adjustment. As every one of us is different we need to have the option of adjusting our work space to our needs. If you’re looking to buy all you need is to click on the links and it will take your right to the Amazon page. I thought you might be interested in standing desks as well since you seem to be health-conscious. You can check some out here: The Perfect Height Adjustable Standing Desk . Thank you again for stopping by and Happy Freelancing! I really like the idea of the laptop stand. It looks pretty portable and I agree that there is need for it. My question comes from your comment about a desktop computer if you are a full-time freelancer. Do you think there is a lot more value to using a desktop for most of your work? The thing I don’t like about desktops is that you are tied to one location. I would like to be mobile. I guess the best of both worlds would be to have a desktop PC and a laptop or tablet. Thank your for the information. I guess the value I see is the health aspect of it. Many who use a laptop, use it for everything (typing, mouse, screen) Long hours of this everyday is horrible on your neck hands, arms because laptops aren’t meant to be ergonomic, they’re meant to be portable. Whereas, desktops are more focused on ergonomics because you set it and forget it. I prefer being mobiel as well but with cloud storage it easy to access your information from anywhere. Having a desktop in your office where you work 80% of the time and then a laptop that you can take with you to be mobile would be a perfect set up. Thanks for stopping by and let me know if you have any questions. Happy Freelancing!